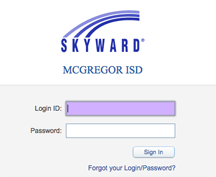 Skyward is the district's online student information system. Skyward Family Access is the online portal providing parents access to information about their students from any device with Internet access. Parents are able to communicate with teachers and easily track their students' grades, homework, attendance, assignments and create email notifications. When a student is enrolled in MISD, the parent is given a secure Family Access account. Parents are required to complete all registration forms within Family Access in order to keep student information current (emergency contacts, medical information, etc). How do I get access? When your child is enrolled in MISD, a Family Access account will be created for you. An active email address is required in order for your Family Access account to be created. Once the account is establish, it will remain active until your student withdraws or graduates from MISD. Your parent account allows you to view all of your enrolled students at one time. Who will be allowed access to my child's information within Family Access? Student data security is a high priority for MISD. Parent or Guardian #1 and Parent or Guardian #2 will be the only ones given access. Each parent will have their own account user name and password. You will be expected to keep your login account information confidential. Do not let others use your login account to access the system. I have forgotten my password and/or username. How do I resolve this? You can try to use the "Forgot My Password" link at the login window. If that does not work, you may call the MISD Tech Department at 254.840.2828 or email tech@mcgregor-isd.org. Your identity will be validated before new account information is given. Who do I call when I have a question or a problem? For questions about information within Skyward Family Access (grades, attendance, etc), please contact your child's campus office. For questions regarding your account or problems with any links, please contact the MISD Tech Department (tech@mcgregor-isd.org | 254.840.2828). For technical issues with your Internet connection, you will need to contact your Internet service provider.